All transactions are safe and secure with a reliable history in online purchasing behind each of our associates. Buy the Cheshire Cat t-shirt to own Alice in Wonderland clothing and merchandise. Alice's long journey begins by falling through a hole into a large room with a miniature door. When she discovers that she can't fit through the door, the talking doorknob informs her to check the bottle on the table labeled "drink me". After consuming it, she shrinks but is then hindered by a lock to which the key is still sitting on the table. At the suggestion of the doorknob, she eats a cookie which transforms her into a giant. After crying, she drinks more and falls in the empty bottle. Luckily, she floats through the door's keyhole in her own tears. 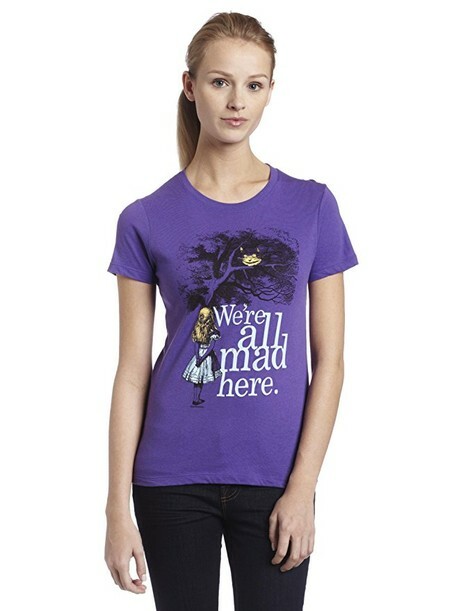 Get this Alice in Wonderland t-shirt to celebrate the Cheshire Cat. In addition to the Cheshire Cat tee above, browse the Alice in Wonderland Clothing Gallery for more apparel like men's and women's clothes, kids shirts or hoodies.